When brushing, hold your toothbrush at a 45-degree angle with the bristle tips aimed at the line where the tooth and gum meet. The bristles of a soft toothbrush clean the food particles in the pockets in front and in back of the tooth, but you need floss to clean between the teeth. Be careful to (gently) get the floss down into the pocket between the tooth and gum. Scrape food particles up and out. Back to toothbrushing: if the toothbrush is not held at the correct angle, the bristles can’t get in the pockets to clean out the bacteria before it turns into enamel-damaging plaque. If plaque builds up in the pockets, the gums can start loosening. Eventually, the pockets will become too deep for your toothbrush bristles to reach. Unfortunately, the tooth structure below the gumline is more susceptible to decay than the enamel above the gumline. There is more than one way to damage your teeth—even if the visible parts of your teeth are cavity-free, gum disease can cause issues with the parts you can’t see. At Kernagis Dental Excellence in Tampa, we remind all our patients to practice good oral hygiene at home, and see us for a checkup twice a year. 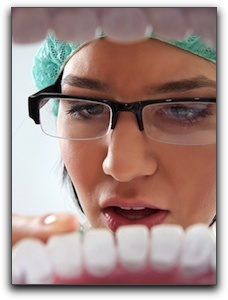 We provide comprehensive general and cosmetic dental services. Schedule your next appointment today.